While foodies across North America were thrilled to watch Olympic coverage with the rest of the world over the past 2 weeks, they have been quietly gearing up for the big event of the summer: the celebration of Julia Child’s 100th birthday this Wednesday, August 15th. In kitchens around the country the smell of great French cooking is filling the air. 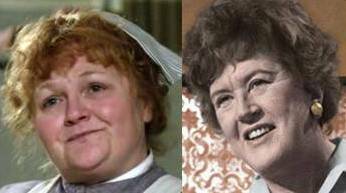 What’s the Connection Between Julia Child & Mrs. Patmore? This is a Downton Abbey food site, right? So why are we talking about Julia Child? She was American, not English, and while born in 1912 which is in the Downton Abbey time line, her real impact did not come until the 1960s. The common thread is French cuisine and how it was introduced to a new country. There were pioneers who brought French cooking to wealthy Britons on a grand scale in the Edwardian era, and then there was Julia who took it to another level in America. Her greatest achievement was to teach French cooking to Americans on a mass scale. A TV pioneer, she came alongside us in our homes as a kindly aunt who was outgoing, funny, fearless and full of encouragement. It was the cooking show which really changed how cooking could be passed from one generation to the next. Many of us still learn to cook standing next to a more experienced cook, and not so long ago that was really the only way anyone would have learned, unless you were really good at reading cookbooks. You can see how cooking was so regionalized; cooks passed along what they knew. Julia really was the first to give us all the opportunity to “apprentice” with someone who had the passion to teach something new, and have fun in the process. Julia’s first task was to translate recipes and document french techniques in a format Americans could understand, but a best selling cookbook was not a new concept. In the Victorian era, Mrs. Beeton gave the English their first mass produced cookbook. Mrs. Beeton was a publisher, not a cook, but carefully collected and organized “receipts” from all sources, and reorganized them into a new format which listed ingredients and then method for preparation. The format stuck and is still how we share recipes today. In the Edwardian era, English gentry followed King Edward VII’s passion for French cuisine. There was a great demand for trained male French chefs in England to head up kitchens in grand country houses like Downton Abbey. I have written about the great French chef Auguste Escoffier who became famous for his own books on french cuisine, his success as a restauranteur, and head of his own cooking school. If an English Lord could not afford or find a male french chef, the next best thing was an English female cook. This created opportunities for those who had learned their craft through apprenticeship. Introducing Mrs. Patmore, who reigned supreme in the kitchens of Downton Abbey. The Dowager was not particularly impressed with Mrs. Patmore’s cooking, and she was likely not classically trained. She would have learned how to cook at the side of a more experienced cook in other households, where there may have been a french trained chef. She, in turn trained her staff, like Daisy, who would eventually leave to head a kitchen of her own at another grand house. As you may recall, both Mrs. Patmore and Daisy gave Lady Sybil a lesson or two. Julia Child, bravely took the teaching concept to a whole new level on television. PBS’s national broadcast of The French Chef reached housewives across the country; women were now able to bring a bit of France into their homes. There are now a multitude of schools who train the next generation of professional chefs, but Julia taught the basics of french cooking to home cooks, and fuel a desire for some young men and women to become chefs themselves. PBS, also American home to Downton Abbey, has been promoting 10 days of Julia from Aug. 5 to 15th, with free videos, recipes and celebrity chef testimonials. There are even restaurants all across the US who are serving Julia’s recipes. It is quite the tribute for America’s first lady of the kitchen. Many of you enjoyed the movie Julie & Julia, particularly those of us who blog about food, and likely day dream about our own blog ending up on film starring Meryl Streep, like Julie Powell. For the rest of us, it gave us inspiration about how much easier it is to write when you can focus on a particular aspect of cooking. For Julie Powell it was the connection with Julia Child, for me, it is was my love for history and Downton Abbey. Follow along at the PBS website, and connect with other foodies on Twitter through #cookforjulia. While Julia had a reputation for using butter in every recipe, the breadth of her repertoire, included healthy French dishes as well. She actually had a whole chapter on clafouti, a nice light summer dessert which is quick to prepare and works with whatever summer fruit you have on hand. 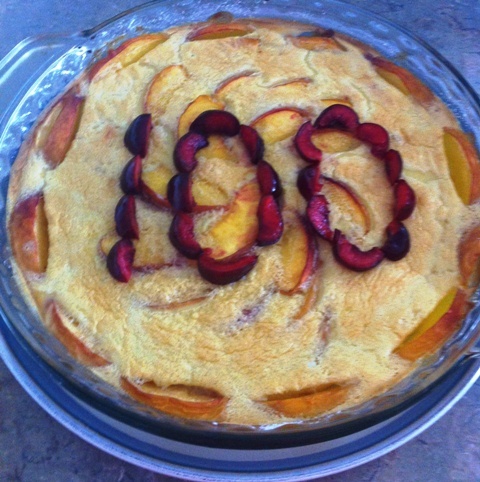 Traditionally it is prepared with cherries, but I used peaches, and used cherries for my tribute. In a blender blend the milk, sugar, eggs, vanilla, cardamom, salt and flour. Pour a 1/4 inch layer of the batter in a buttered 7 or 8 cup lightly buttered fireproof baking dish. Place in the oven* until a film of batter sets in the pan (about 2-3 minutes). Remove from the heat and spread the peaches over the batter. Sprinkle on the remaining 1/3 cup of sugar. Pour on the rest of the batter. Bake at 350 F degrees for about 45 minutes to an hour. The clafouti is done when puffed and brown, and a knife plunged in the center comes out clean. Sprinkle with powdered sugar, serve warm. *Julia’s original recipe calls for setting the batter on the stove top, but you either need to use a fireproof dish which can go on the stove (like pyrex) or set the dish in the oven. Yes, I learned this the hard way, but it’s all good. I love this blog and the series Downton Abbey! I also belong to a Julia Child Supper Club group. We meet 5 times a year to create elaborate meals from recipes out of Mastering the Art of French Cooking by Julia Child. Enjoy this lovely Downton Abbey Cooks blog as much as I! Yum! I think I’ll make this tonight! Hey ma, no crust! It is delightfully simple and lovely to look at. We’re making clafouti again this week!! I’ve still got tons of cherries and now plums this week! SO EXCITED!